Written by Jon Hazell on 11 January 2013 . You may be thinking, "How on earth could dashboards be used for good or evil?" Aside from the obvious, using it to measure how many evil things you've done (evil success vs. evil failures), there is another way: misrepresenting the data you are displaying. Unfortunately, the power that data visualization has to augment cognition can be used to distort reality. Wow! In this example it appears there is a huge gap. 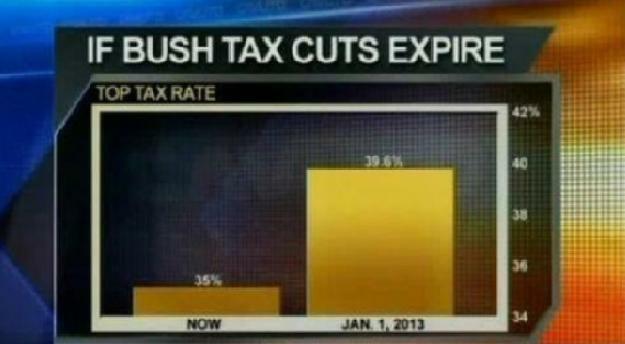 When the tax cuts President Bush put in place expire, taxes are going to explode! It’s quite possible this is the beginning of the end. But wait… 35% to 39.6%? Well that’s only a 4.6% increase. So why does this look so apocalyptic? 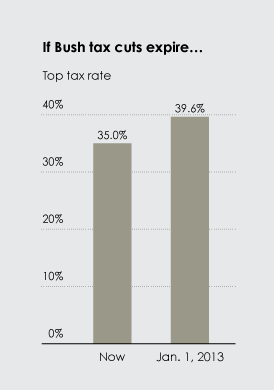 The Y axis starts at 34%. To give the authors of this graph some credit (they shall remain nameless, though I’m sure many people can guess) they did start it at 34% and not at 35% which would have made it even more dramatic. When we make such strong claims, and use strong words like “good” and “evil”, we need to provide a credible and quantitative way of evaluating or backing up our claims. This is where Edward Tufte’s “lie factor” comes in. The lie factor is a very simple calculation. Here’s a quick example. You have 2 numbers that you want to display on a simple bar graph: 80, and 100. Example one: The Y-axis starts at 0. The 2 bars are, respectively, 80 pixels and 100 pixels tall. Example two: The Y-axis starts at 70. The 2 bars are, respectively, 10 pixels and 30 pixels tall. How do you calculate size of effect? In order for data visualization to function properly, as well to accurately provide insight into one’s data and enable people to take action, it should display the data as accurately and unbiased as possible. When this is not done the information becomes skewed visually, our minds don’t process the information the way they should. Whether it is intentionally or unintentionally, we are deceived. I hope people will strive to use dashboards for “good” rather than “evil”, but of course there will always be certain parties that will want to display results in ways that skew it to suit their need(s). It is important we remain aware of that and always take a deeper look at the information we are presented with. Finally we’ll leave you with an open question: Given that graphics in data visualization are used in the place of words and numbers to present evidence, can presenting a technically-incorrect graphic be equated to presenting incorrect numbers?